In Music We Trust - INTERVIEW: Jennifer Hope: Gothic and New Age Music? 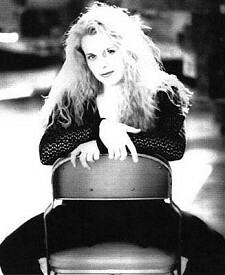 Blurring the edges of both gothic and new age music genres with her serene music, Jennifer has created a bit of controversy as to the category best used in the description of her music. California-based solo artist, Jennifer Hope, recently released her debut EP "Winds of Tomorrow", featuring the tracks, "What's Inside", "Passing of Our Worlds", "The Sky is Blushing", and "Angels Alone". "The Sky is Blushing" appears on the fantastic Unquiet Grave compilation put out a couple years ago by Cleopatra records. Additionally, Jennifer Hope tracks will appear soon on other compilations. Sonya: You have described your sound as both "Dark Gothic" and "Alternative New Age". Why do you believe these 2 diverse labels apply to your music? Jennifer: Everyone seems to either call my music Gothic, Ethereal, New Age or a combination of these. After hearing other artists that are considered Gothic like "Black Tape for a Blue Girl" and "The Shroud" I can hear some similarities. I can also hear similarities with Enya who is labeled as New Age, but I call it Alternative New Age because a lot of the time people think of Classical Music put to ocean waves when they hear the term New Age. Also, characteristics of both of those subcultures are also a part of who I am and my music is a reflection of me. Sonya: Who is handling the sales and retail distribution for your EP "Winds of Tomorrow" off-line? Jennifer: Audioglobe is, they are based in Italy but they have accounts all over Europe and in the US. A lot of their accounts are retail stores. Several of the other companies distributing my EP also have retail accounts like Metropolis Records. Sonya: Where is "Winds of Tomorrow" available on-line? 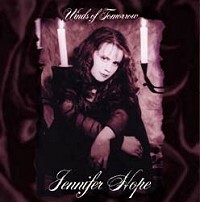 Jennifer: Amazon.com (USA), Metropolis Records (USA), Middle Pillar (USA), AirMusic.com (USA), Seraph (Chicago), Frontstage.com (Belgium), jenniferhope.com and very soon Sappho Music (France). Sonya: What plans are in progress toward releasing a full length CD? Jennifer: The full length CD is in progress now. It is taking longer than I originally planned because I was going to include the tracks from the EP on the full length CD, now I have decided to include more new songs instead. I am currently planning and doing everything in preparation for the release of the full length CD from writing and recording the tracks to developing merchandise, designing new press kits, writing a new bio, continuing to make more/new radio and press contacts, etc. Sonya: What special training and skills do you bring to "Winds of Tomorrow"? Jennifer: I have been doing music in some form since I was nine years old. I think all the music I have written and all the instruments I have played in the past have given me various musical skills and developed my musicianship which makes my songs the way they are. Another thing (perhaps the most important) I bring to my songs is my visions of life and different colors of emotions that make the music become like one instrument that makes it possible for me to express so much of myself (passing and remaining parts) that would otherwise be very repressed. Sonya: Where may readers find audio files of your music? Jennifer: As far as I know only on my web site so far. A few other sites wanted to put my songs up but I didn't like that idea. They wanted them to be full length MP3's. Sonya: How has Lino Alessio contributed to music available on your EP? Jennifer: He worked with me to come up with guitar parts. I do not play guitar at all so he was helpful in making ideas I was hearing in my head come out and adding to them. Sonya: What equipment did you use in production of "Winds of Tomorrow"? Jennifer: Always starts with my piano and voice. Then the equipment in the studio I work with my producer in, basic keyboard to play all the loaded in sounds/instruments on, drum machine, etc. and Lino played live guitar - I really don't like sampled guitar sounds. Sonya: Which tracks on "Winds of Tomorrow" gave you the most difficulty? Jennifer: Music-wise none really except for the drums/percussion on "The Sky is Blushing". Voice-wise "Passing of our Worlds". Sonya: Where and when do you plan to tour? Jennifer: That all depends if I end up in a partnership with a company that can offer tour support. If that happens I would ideally like to go everywhere that has shown interest in my music, Spain, Italy, France, US, Belgium, etc. as soon as the full length CD is done. Otherwise I will have to play locally and in surrounding cities. Sonya: "The Sky is Blushing", appears on the Cleopatra compilation, "The Unquiet Grave". How does the Cleopatra version differ from the version that appears on "Winds of Tomorrow"? Jennifer: There is no difference. Cleopatra took the track off of the EP, any difference would be in the mastering. Sonya: How much time transpired between conception and recording of "Winds of Tomorrow"? Jennifer: The thought to do it, the writing and the recording all pretty much happened simultaneously. It just all seemed to start and continue together. That's the way I work, when I get an idea to do something that I am really passionate about I have to make it happen. I don't like wasting time. Another reason I think it worked out this way is because I have to pay for it all, so it's not like I could just write a bunch of songs and then go record them all at the same time. Sonya: What plans do you have for future compilations? Jennifer: There are a few more I will be appearing on later this year. There's also a few possibilities that are not sure things yet. I plan to continue increasing compilation appearances with tracks from the EP and the upcoming full length CD - not exclusive tracks. I plan to submit for independent films too. Sonya: When have you collaborated on musical projects with other musicians? Jennifer: I have played in several bands and orchestras in the past. Currently, I would consider working with my producer on a collaboration of sorts, maybe more of a partnership. Also, working with Lino on guitar parts. If my budget increases I would love to work with more musicians on live instrument tracks and live performances. Sonya: What do you believe has most influenced your music? Jennifer: Who I am and have always been by nature also my life experiences and who it made me. Sonya: Issue 12 of Outburn Magazine (May 2000) features both a music review and an advertisement for "Winds of Tomorrow". How has this exposure impacted the sales and distribution for your EP? Jennifer: It's hard to tell what and how much each thing I do has influenced sales and distribution of my EP. I have gotten quite a few write UP's in magazines and web zines, and a good amount of air play in quiet a few countries. Sonya: Octavia's review of your EP indicates you have experience with flute, piano, drums, violin, and clarinet. When and where did your musical training begin? Jennifer: Really it began in First grade in Minnesota. The elementary school I went to included music as a subject. We had performances and everything. Then it began again in California 4th grade elementary school with the violin in the school orchestra. Sonya: How would you describe "New Age Goth" to our readers? Jennifer: A soothing and serene, mixture of musical sounds to encourage and create a deeper, spiritual ambiance slightly on the darker side. Sonya: Who else might you like to collaborate with on future recordings? Jennifer: PETER STEELE FROM TYPE O NEGATIVE!!!!! Sonya: Who would you list among your musical favorites today? Jennifer: Enya, Loreenna Mckennitt, Sarah Mclachlan, Tori Amos, Delirium and Edera - even though I have no idea what happened to them.